Just like Windows 7, upcoming Windows 8 operating system also feature concept of user accounts. You can create one or more user accounts and use either to login and use your Windows 8 computer. The routine of entering password everytime you start Windows 8 is boring and time consuming. 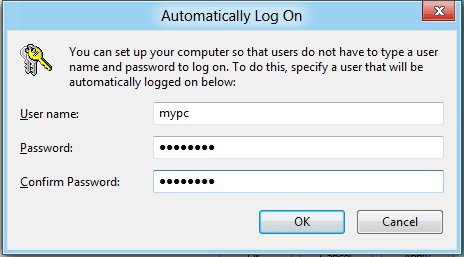 You can easily get rid of this and login Windows 8 PC directly without need to enter password by activating automatic login feature. 1. While you are on Windows 8 desktop screen, press Win + R keys to open the Run box. 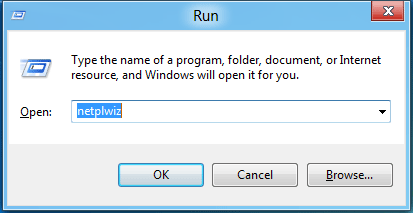 Then type netplwiz in the Run box and press the Enter key. Alternatively, you can select Search option from Start Menu and then type netplwiz in search box to open User Accounts box. 2. You should have User Accounts box on the screen with tabs like Users and Advanced. Under Users tab all the registered users of your Windows 8 system are listed. Click to select your username being used by you on the system. 3. Then click to uncheck (no tick) “Users must enter a user name and password to use this computer” option. Click Apply button and you should see “Automatically Log On’ box on the screen. 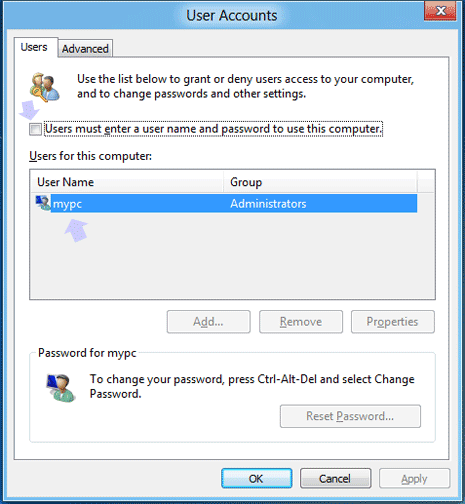 Type user account password in the password and confirm password text boxes and click OK.
From now on, when your Windows 8 system starts – there will be no prompt to enter password. Windows 8 computer will boot automatically to the desktop screen – no more annoying password prompts!